Just trust your legs, you’ll just flow downhill! It’s uphill I struggle with. Lol – love the imagery. Me too! 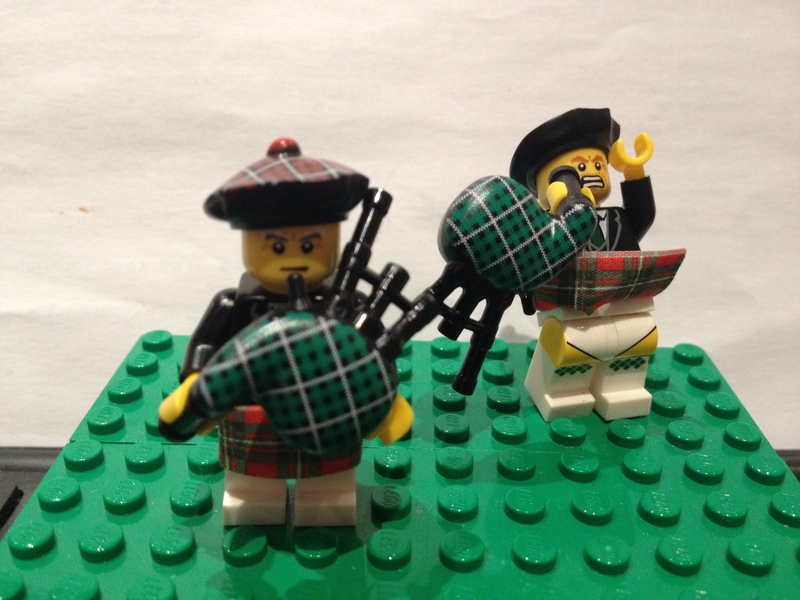 Lego with bagpipes – just too awesome for words! I’m with runorgocrazy, give me the downhills anytime – you did well just getting out there after that sort of day! Are we really that close to July? To me it looks that my trail running here in France inspires the masses. Well done on the trails, inclines and bagpipes! P.S. The advice I’ve heard when my feet got blisters was: “Run barefoot”. Just an idea…. Where did you get the Scottish lego. My brother and hubby both play the bagpipes so would love to get them some. I ran the Aviemore 10 last year. All downhill. Felt fine on the day but my goodness my legs have never hurt more the day after. Get the training in. The lego is from the latest series (7) of lego mini figures, available in toy shops whsmiths, etc. 16 to collect and you buy a sealed bag and take pot luck! So although only £2 each you could buy alot to get the ones you want…. or go to amazon and pay £6! Love your daily Lego Pics ! !